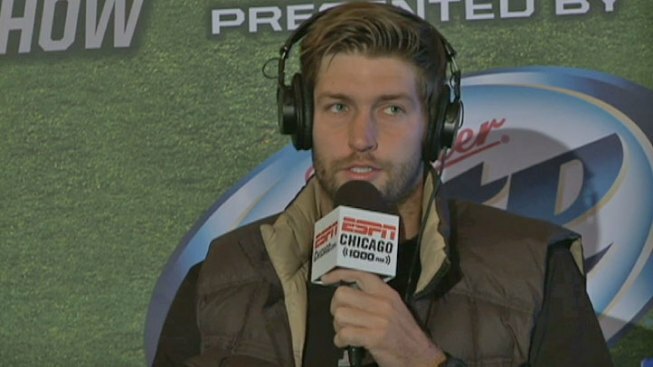 On ESPN Chicago's "The Jay Cutler Show" on Tuesday, Bears quarterback Jay Cutler took responsibility for Thursday night's abysmal loss to the Packers. He also talked about the incident with J'Marcus Webb that got football players, both current and former, talking. If you didn't see the incident, it went something like this: Webb wasn't playing well against the Packers' Clay Matthews. Matthews was consistently cleaning Cutler's clock in the back field. Cutler had enough at one point, yelled at Webb as they walked off the field, and ultimately gave the left tackle a shoulder check. Since then, everyone from Terry Bradshaw to Cutler's teammate D.J. Moore said Cutler shouldn't have handled Webb's problems that way. "I can't put a definite reason why it happened. It's emotional. I put a lot into playing quarterback and I take it seriously. Since then, we've talked about it and put it behind us." Cutler said he discussed the incident with the powers-that-be and each offensive linemen individually. As to Moore, Cutler pointed out what Moore said about not airing dirty laundry to the media. "DJ's right on his last quote. I'm not going to badmouth someone in the media. He's entitled to his opinion." Besides the shove, Cutler also took responsibility for how the offense played. The Bears scored just 10 points and gained 168 yards. Cutler threw four interceptions and was sacked seven times. "Offensively, it starts with me, and it's gotta trickle down. I've got to play better," Cutler said.